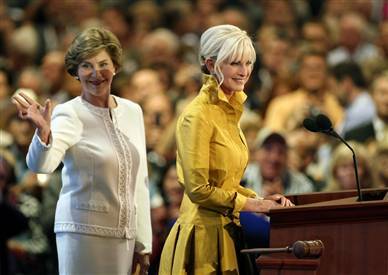 Cindy McCain and Laura Bush appeared together at the Republican convention yesterday and offered uplifting fare to the 17 delegates in attendance. In a surprisingly bold move, Cindy offered the following bit of wardrobe advice: “This is a time when we take off our Republican hats and put on our American hats.” Brave and inspiring words, indeed! However, in this blogger’s search of the internet, I have found NO evidence that either woman owns a Republican hat, let alone an American hat. After all the flap about Obama and his flag pin, you’d think that these ladies would have had the decency and patriotism to at least have the hats to which they are referring. At the very least, this is more evidence of the poor planning of John McCain and his team of mavericks. More ominously, it does lead one to worry – do they even care about their Republican and American hats? Are they real Republicans and real Americans? Without the hats, how can we know for sure? … then, of course, there is all the ongoing Palin stuff! My prediction? She’ll be gone before the new NFL season kicks off on Thursday night (with an upset of the Giants by the Redskins, I might add). This entry was posted in Politics and tagged American, american hat, Bush, CB, Cindy, Cindy McCain, Giants, John McCain, Laura, laura bush, McCain, NFL, Obama, palin, patriotism, Redskins, Republican, republican convention, Republican hat, Republicans. Bookmark the permalink. As you said before … lech .. yech! The more I read about Sarah Palin, the more complete a picture I get of an ambitious, career-driven woman who will stop at nothing to get what she wants; a small-town beauty queen determined to make a name for herself — no matter who she has to trample or neglect to get there. I know that a politician’s “beliefs” are like leaves fluttering on a fickle wind, but there sure do seem to be a lot of contradictions swirling around Palin. A champion of breaking the “old boy network” who takes full advantage of that system to get what she wants? A firm proponent of “conservative family values” who has no second thoughts about leaving her newborn son with Down Syndrome — as well as her pregnant teenage daughter — at home while she not only campaigns all around the lower-48, but (God help us) knowing full well that her family time will be even less frequent should the Dark Side win the day again in November? A “reformer” who takes on unethical behavior by elected officials — but (ab)uses her power and influence to exact revenge on her sister’s ex-husband? I’m pretty convinced by now that Palin went to her interview with McCain in a low-cut blouse, and that sealed the deal for him!